Like many other large marine megafauna, manta rays are planktivores, feeding on small marine invertebrates called zooplankton and occasionally small species of fish. Zooplankton, characterized by their inability to fight the predominating current, were named for their tendency to ‘drift’ or ‘wander’. These small animals bloom in large numbers creating incredible amounts of biomass and providing a feast for manta rays. Manta rays employ many different types of feeding modes when trying to capture this tiny food source. When plankton is distributed evenly in the water column they will simply feed mid-water with their enormous mouths open, sieving the tiny particulate animals from the surrounding liquid with specialized gill rakers. This is called RAM feeding. These highly modified gill rakers act like sieves, preventing the food particles from passing over their gills. After being trapped by the rakers, manta rays close their enormous mouths, literally coughing the plankton particles to the back of their throats where they are swallowed in large gulps. The opening to their esophagus (i.e. their throat) is approximately the size of an average human fist. It is for this reason that they cannot eat larger food items and pose no threat to humans. Manta rays also feed at the surface with their backs out of the water, using their wide mouths to skim off floating plankton that has collected in large mats at the surface. When manta rays employ this feeding behaviour, individuals are seen gulping at surface waters, creating large turbulent wakes in their paths as they travel along. They can be seen at incredible distances when feeding at the surface as their enormous pectoral fins periodically rising out of the water. While the above-mentioned foraging methods are probably the most commonly observed feeding modes, manta rays will alter their behaviour to suit the conditions around them. For instance, if plankton is densely concentrated in one location, individual rays are often observed barrel rolling in the water column, a behaviour that facilitates them staying in one spot. While making these dramatic vertical loops, individuals are able to feed more efficiently on one area of concentrated plankton. Sometimes individuals are seen barrel rollCoop feeding in these dense patches of food for hours at a time. Manta rays are also known to feed together on mass, in apparent cooperative behaviours. One such behaviour seems to involve individual mantas stacking themselves in long chains, each ray swimming slightly above the one in front, creating one large collective mouth. This cooperative behavior is hypothesized to trap the plankton that has tried to escape from the path of the individual swimming in front of it. Manta rays are also on rare occasion seen to employ what is known as ‘cyclonic feeding’. When conditions are right and dense concentrations of plankton are trapped in small bays or channels, dozens, sometimes hundreds of individual manta rays will gather on mass. Despite their frenzied appearance, these rays swim in calculated patterns creating powerful cyclonic currents with a centralized vortex which herds and traps their prey, directing it into their mouths. In perhaps the most unusual method outlined yet manta rays can also bottom feed. If their plankton prey has fallen out of the water column, or has sunk to the sea floor to avoid predation, or on occasion if swarms of small invertebrates emerge just above the surface of the sand, mantas will dramatically change their behaviour yet again and feed right off the ground. It what can only be likened to a vacuum, manta rays will scrape their wide terminal mouths across the sea bed sucking up all the prey items in their path. On rare occasion, individual rays will even change the position of their cephalic fins, holding them out, away from the center of their mouth like outstretched arms. This positioning allows them to get even closer to the sea floor, trapping any prey items that try to escape with their splayed fins, directing them back into their cavernous mouths. Both species of manta ray are known to pay frequent visits to reef cleaning stations. A cleaning station is a specific section of reef that is home to a number of reef-dwelling cleaner fish, who literally clean large marine animals such as sharks, rays and larger bony fish. They do so by eating the parasites, dead skin, bacteria and mucus off of the body surface and gills of the larger fish, as well as from the inside of their mouth. This cleaning process is an example of mutualistic symbiosis, meaning that both parties (the manta ray and the cleaner fish) benefit from the interaction. 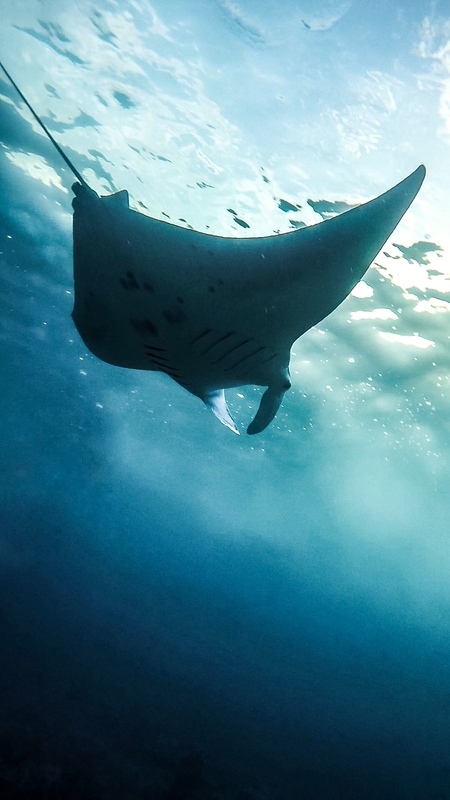 Cleaning helps to maintain the health of manta rays; cleaner fish remove any ectoparasites living on the skin and clean dead or infected skin from wounds, aiding the healing process and helping to prevent infection. Simultaneously, the cleaner fish are provided with a regular and easily accessible source of food. Mating takes place at different times of the year in different parts of the manta’s range. Courtship is difficult to observe in this fast-swimming fish, although mating “trains” with multiple individuals swimming closely behind each other are sometimes seen in shallow water. The mating sequence may be triggered by a full moon and seems to be initiated by a male following closely behind a female. The fertilized eggs develop within the female’s oviduct. At first they are enclosed in an egg case while the developing embryos absorb the yolk. After hatching, the pups remain in the oviduct. With no umbilical cord or placenta, the unborn pup relies on buccal pumping to obtain oxygen. Brood size is usually one or occasionally two babies. The gestation period is thought to be twelve to thirteen months. When fully developed, the pup resembles a miniature adult and is expelled from the oviduct with no further parental care.